Admiral James T. Kirk, former Captain of the "U.S.S. Enterprise" TM and now Chief of Starfleet Operations, is at a crossroads in his career. When he is assigned to supervise the testing of the "U.S.S. Recovery, " an experimental new rescue vessel, he begins to realize how tired he is of being trapped behind a desk, away from the action. 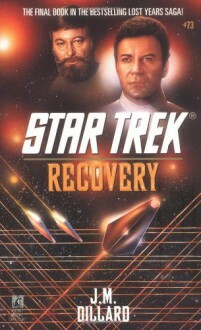 Fully automated, the "Recovery" is a high-speed transport vessel capable of evacuating large populations without risking the lives of Starfleet personnel. But when its creator falls under alien influence, the "Recovery" becomes a pawn in a deadly game that could lead to interstellar war. Trapped in the bowels of the ship is Admiral Kirk's old friend Dr. Leonard "Bones" McCoy, who is being hunted by a homicidal madman determined that no one on the ship will survive. Taking command of a starship, Admiral Kirk must find a way to save Dr. McCoy's life, and save the galaxy from deadly chaos.